This is a beautiful large, musical jewellery box, made in Italy in the 1920s. 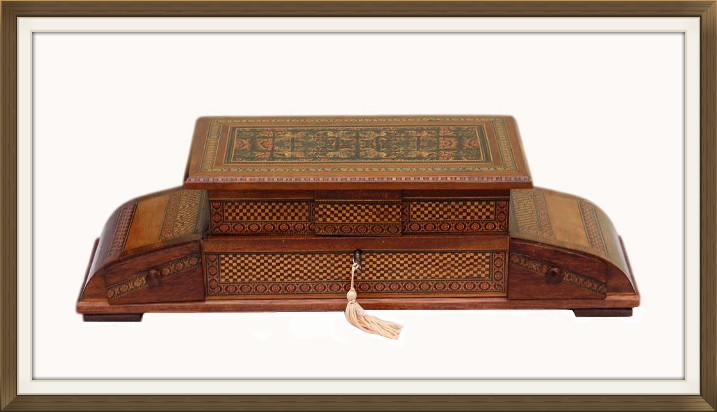 It is primarily made of Mahogany and Olive wood, and has beautiful inlay which is made up of several other varieties of wood! There is a description of Olive Wood further down this page. 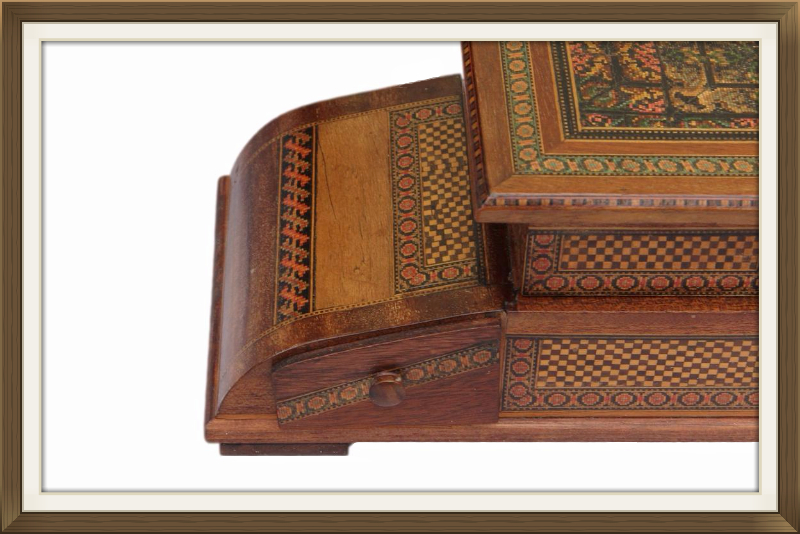 The box has an abundance of micro mosaic inlay, known as 'mosaic tesselated inlay'. This type of inlay is made up of 100s and 1000s of tiny pieces of wood, painstakingly put together to form intricate mosaic designs. There is a large inlaid panel to the centre of the lid which has a stunning tapestry like appearance. 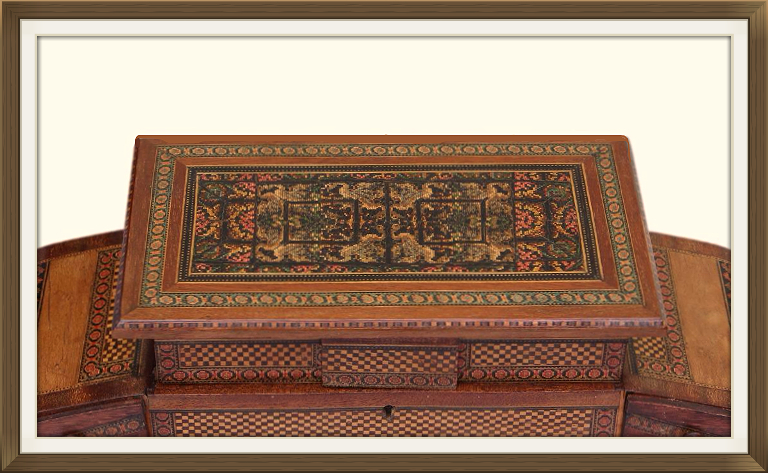 This has a beautiful inlaid border with stringing along each edge. There is a further inlaid border, again with stringing, around this elaborate centre panel. There are also strips of beautiful inlay around all four sides of the lid. 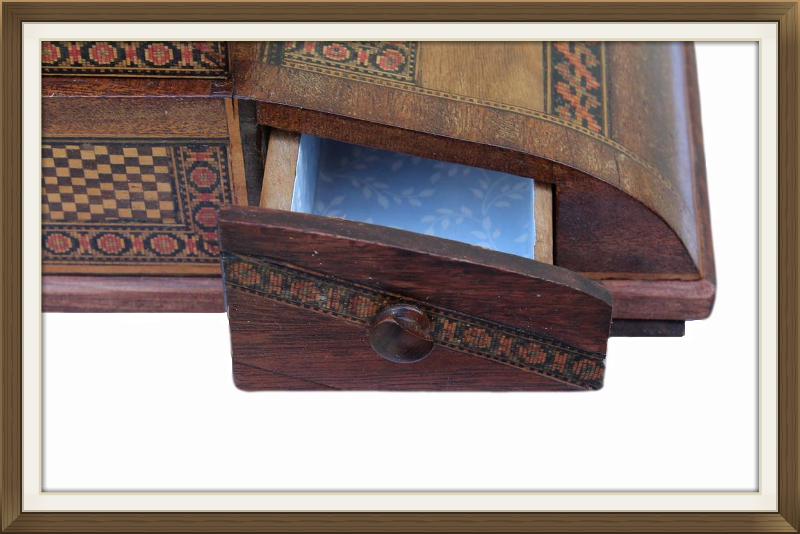 There are beautiful floral and checkered bands of inlay to the lower section of the box. This is on all four sides, including the back, the drawers, and also the lock flap. 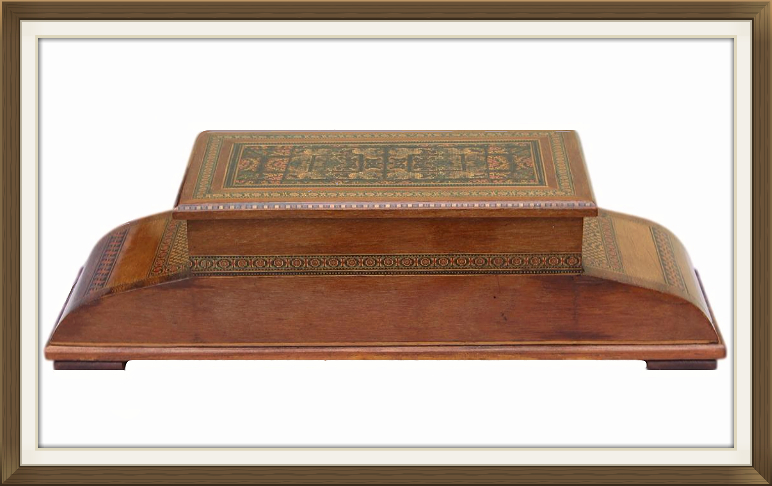 The top of the box is beautifully raised and has a stylish broad lid. The bottom section of the box is beautifully elongated, and has eye catching curved sides. There are two compartments beneath the lid which swing open to the side, plus two more compartments beneath these. There are also two drawers at the front of the box for further jewellery storage. As you can see there is a lot of storage space within this wonderful large box! 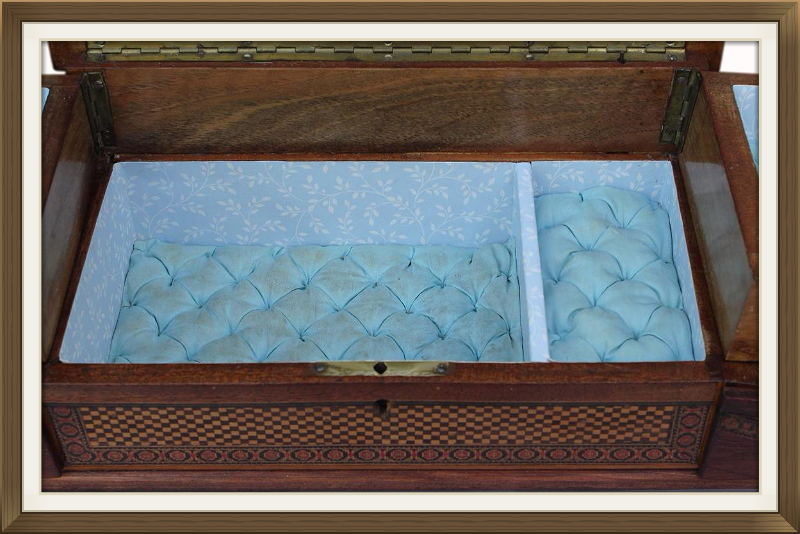 All of the compartments have their original padded, quilted satin panels, and their walls are newly lined with floral paper. This is a pretty pastel blue with white sprays of leaves. This same paper has also been used to reline the drawers. The satin is a lovely baby blue shade. 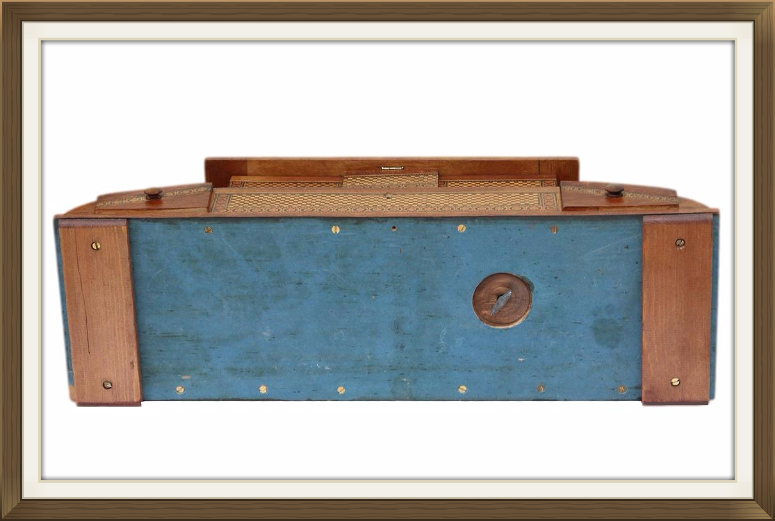 The lid has a long brass piano stop hinge which prevents it from falling back, and the top two compartments are also hinged. 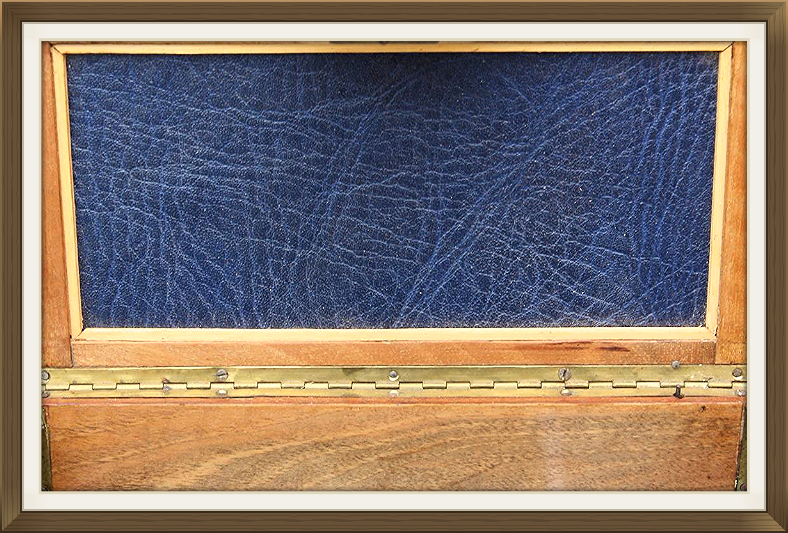 The inside of the lid has a new leatherette covering, added to conceal and protect the underside of the inlaid panel. The box is complete with its original key and brass lock. The box plays the beautiful famous Italian tune, 'O Sole Mio'. This winds up via a key on the base of the box. Just 3 turns of the key is sufficient to wind up the musical movement. The music stops as it should, when the lid is closed, or when the movement is fully unwound. We would like to make you aware that vintage locks and musical movements can suddenly malfunction at any time. They are already very old and will naturally have some wear from age and use. We are not responsible for locks or movements that malfunction from further age and use, once the box is purchased. You can view our full returns policy which includes locks and movements, by visiting our Payments And Returns page. 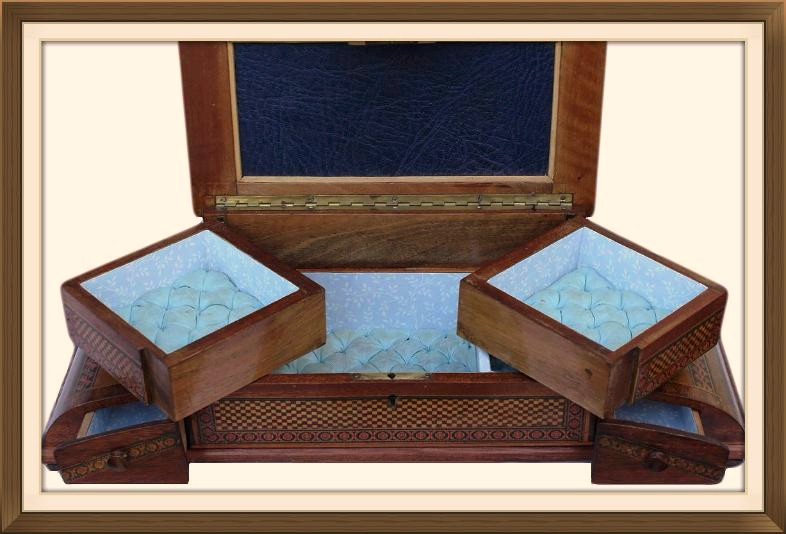 This wonderful box is in excellent condition for its 95 years of age. It is structurally sound, and nice and solid! There is a thin slither of wood missing to the little button handle of the right drawer. This has been smoothed and is not overly obvious. The silk to the interior has picked up some staining over the years. This is as you'd expect from a genuine old box which has been loved and used. In our opinion it adds charm to the box. We do not recommend cleaning the satin as doing so could spoil the colour. The box may not make a suitable gift for those who prefer a perfect interior. It will be most suited to those who the love the charm of a genuine old box with signs of use. Each 9cm square with a 2.5cm depth. 16 by 10.2cm with a 4.5cm depth. 10.2 by 5.2cm with a 1.5cm depth. Depths are approximate due to the uneven height of the quilting. This box will be posted FREE within the UK by Parcelforce Express 48hr delivery. International postage is £25 by Royal Mail International Tracked. Delivery is within 5-7 working days. Enjoy £10 off Vintage & Antique Jewellery plus free next day delivery on our sister site, The Antique Jewellery Shop. See website for details.